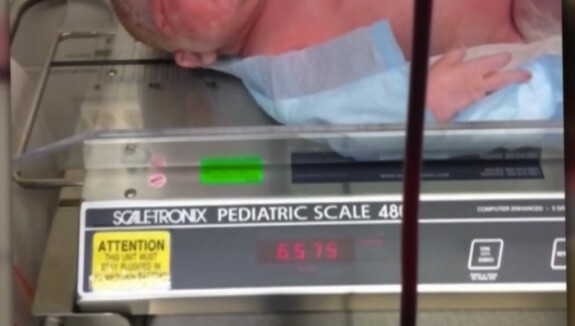 Massachusetts Mom Gives Birth To a 14.5lb Baby Girl! 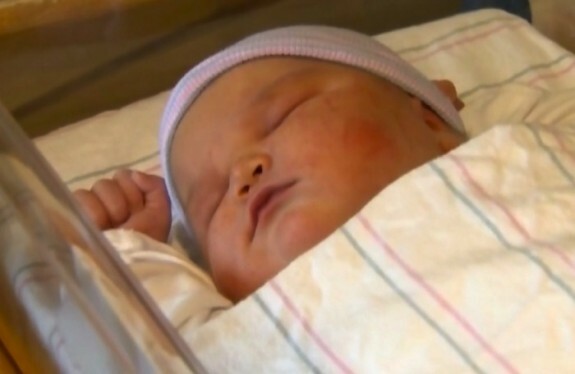 Home » Massachusetts Mom Gives Birth To a 14.5lb Baby Girl! Caroline Ruscak was expecting a large baby, but even she was surprised when her baby girl arrived weigh more than 14lbs. The biggest baby to be born at Massachusetts General hospital in 12 years, and possibly the biggest in the state this year, baby Carisa was more than twice the size of the average newborn. “I heard the weight and I was like, ‘Oh my God.’ It validated me because I was in a lot of pain when I was pregnant, so to hear the size, it made sense,” the new mom told WCVB. Equally surprised, dad Bryan had to do a double take when they placed her on the scale. “When she came out at 14 and a half pounds, I couldn’t believe it. I took a picture of the scale just to document it because I couldn’t believe how big she was. And long too — 22 inches is long. That’s what we like long and big. That’s what I am,” he said. The couple’s first child was a 10 pounder so doctors were preparing for this one to be larger than average. “We expected her to have a big baby. Her first baby was 10 and a half pounds, so we weren’t surprised. We were expecting a big baby, but we weren’t expecting one quite that big,” Dr. Jennifer Kickham said. The new dad says he’s prepared to be teased about his growing family, but he’s proud of his girls. “I’ve been teased a lot so I’m a good sport, no problem with me long as they don’t say anything bad about my little girl,” he said. “Big and beautiful: Claudia and Carisa. I’ll be in trouble in a few years, but that’s OK. I feel very lucky,” he continued. Big and bigger babies are becoming normal it seems the world over. First it was California baby Andrew Jacob who arrived weighing 15lbs 2ozs, then came the news of baby Sammisano Joshua Talai Otuhiva who was born in August last year weighing more than 16 lbs! Earlier this year a mom in China also gave birth to 15.7lb baby, whom she nicknamed Little Chubby.